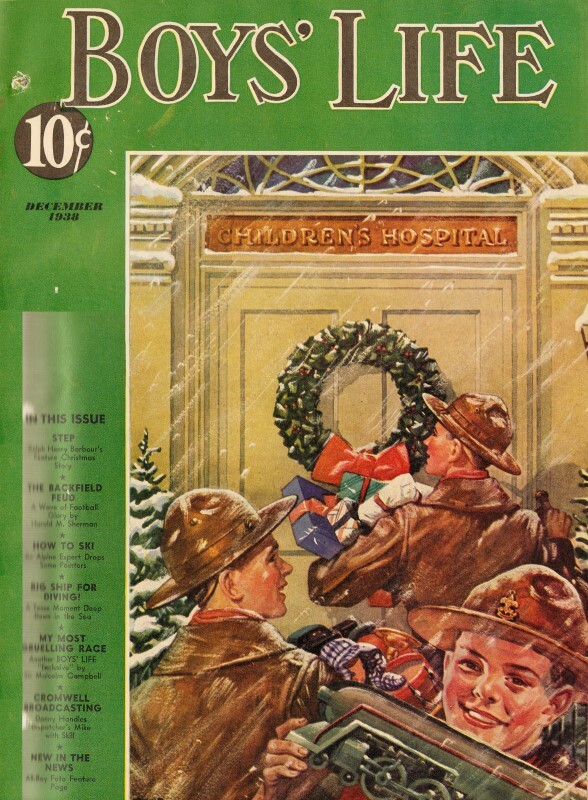 The Boy Scouts of America has published Boys' Life since January 1, 1911. I received it for a couple years in the late 1960s while in the Scouts. I have begun buying copies on eBay to look for useful articles. As time permits, I will be glad to scan articles for you. All copyrights (if any) are hereby acknowledged. Here are the Boys' Life issues I have so far. 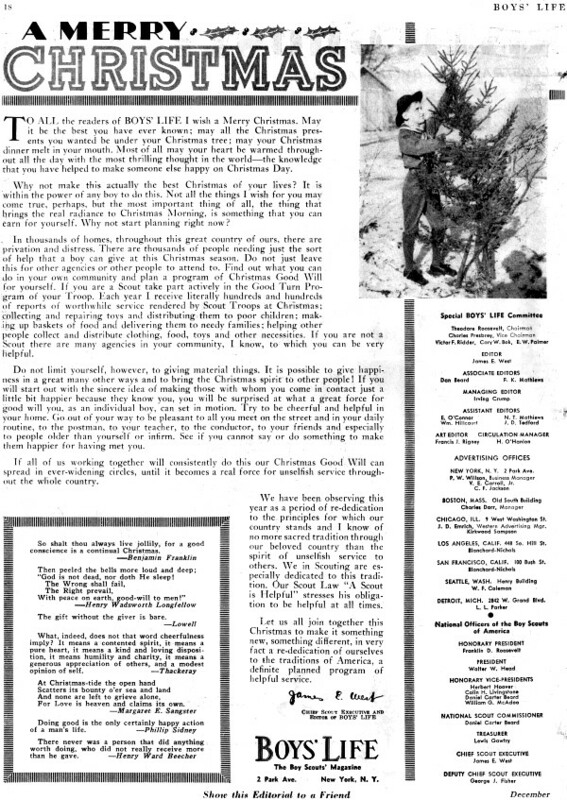 Eighty years ago - or for that matter just twenty-five years ago - it was commonplace for magazine editors to print a "Merry Christmas" message to its readers. Thanks to a host of agitator individuals and groups, doing so would likely trigger the snowflake gene and cause a flood of complaints from the offended (often times otherwise uninterested people who look for good organizations to corrupt). Editorial boards, unnecessarily desperate to avoid the appearance of racism, sexism, xenophobia, homophobia, and any form of conjured up defamatory label, usually cave to pressure and change the very nature of the publication in order to comply with demands. The longtime supporters and actual readers are made to suffer and have their interests subdued in the process. Good people rarely stand up for their rights while agitators seem to have plenty of time to ruin other people's lives. In today's environment, Boys' Life would be deluged with hateful comments for daring to print this utterly loving, hopeful, truly inoffensive message, if for no other reason than presenting the word "Christmas." It is long past time to reverse the trend. Oh, BTW, Merry Christmas to you and yours! To All the readers of BOYS' LIFE I wish a Merry Christmas. May it be the best you have ever known; may all the Christmas presents you wanted be under your Christmas tree; may your Christmas dinner melt in your mouth. Most of all may your heart be warmed throughout all the day with the most thrilling thought in the world - the knowledge that you have helped to make someone else happy on Christmas Day. Why not make this actually the best Christmas of your lives? It is within the power of any boy to do this. Not all the things I wish for you may come true, perhaps, but the most important thing of all, the thing that brings the real radiance to Christmas Morning, is something that you can earn for yourself. Why not start planning right now? In thousands of homes, throughout this great country of ours, there are privation and distress, There are thousands of people needing just the sort of help that a boy can give at this Christmas season. Do not just leave this for other agencies or other people to attend to. Find out what you can do in your own community and plan a program of Christmas Good Will for yourself. If you are a Scout take part actively in the Good Turn Program of your Troop. 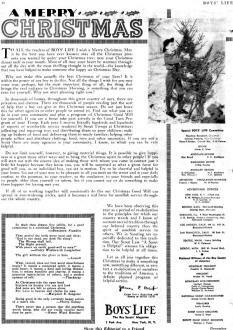 Each year I receive literally hundreds and hundreds of reports of worthwhile service rendered by Scout Troops at Christmas; collecting and repairing toys and distributing them to poor children; making up baskets of food and delivering them to needy families; helping other people collect and distribute clothing, food, toys and other necessities. If you are not a Scout there are many agencies in your community, I know, to which you can be very helpful. Do not limit yourself, however, to giving material things. It is possible to give happiness in a great many other ways and to bring the Christmas spirit to other people! If you will start out with the sincere idea of making those with whom you come in contact just a little bit happier because they know you, you will be surprised at what a great force for good will you, as an individual boy, can set in motion, Try to be cheerful and helpful in your home. Go out of your way to be pleasant to all you meet on the street and in your daily routine, to the postman, to your teacher, to the conductor, to your friends and especially to people older than yourself or infirm. See if you cannot say do something to make them happier for having met you. If all of us working together will consistently do this our Christmas Good Will can spread in ever-widening circles, until it becomes a real force for unselfish service through­out the whole country. Let us all join together this Christmas to make it something new, something different, in very fact a rededication of ourselves to the traditions of America, a definite planned program of helpful service.